b. My yard is a dandelion happy zone. It's always d. isn't it?! I'm not a fan of memoirs, unless they make me laugh, although I would characterize this more as essays on life but who's asking me. 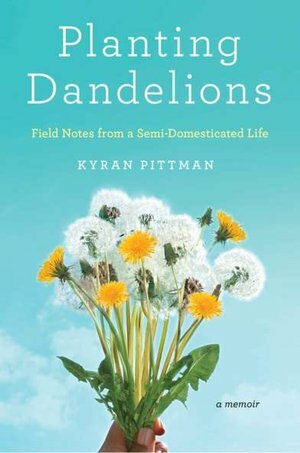 Kyran's lead an interesting and bold life and she easily pokes fun at herself in a nice witty way. I read her blog now and then, which spurred me to check out the book. Laughter feels good and this book gave me that rare opportunity to look ridiculous, laughing out loud, while I sat for hours waiting for Groovy Girl to finish bending and bouncing her way through gymnastics class. That's funny because that's me except I would beg to bring in a less-sugary option or organic lemonade only to be met with glares from both room moms and kids. My kid, depending on the day and which kid, would either cheer me on or hang their head in shame. I hate red dye and skittles too! Sliced in between the humor there are many poignant moments of insightful parenting knowledge that only a really good writer can pull from their own daily life. I kept thinking to myself-oh, that makes sense, how come I've never thought about that. It is difficult to remember that we can step away-our kids do understand at an early age-all the important things that matter and we can be ready for the question and answer segment, which usually comes while we are cooking. I enjoyed how she shared her relationship with her three boys, they sound like interesting and lovely children. While this isn't a parenting book it did give me some perspective on taking myself too seriously on the parenting front. Kyran's theme throughout is that her Newfoundland childhood was unique which fuels her desire for a more ordered life here in the states as she raises her family. Married once in Canada she had an affair with Patrick and it is he that eventually brings her to his homeland of Little Rock, Arkansas. Her and Patrick live the vagabond's dream as they wander around Mexico for a while and then return to the States broke but in love. He plays in a band and she works as a waitress, high on life and each other until Patrick proposes and the idea of a domestic life looms large over her head, angst follows along with babies. As a hippie girl myself I try to take the road less traveled and still fit that into my roles of mom and wife. It is not an easy task and there are daily roadblocks. I found Kyran's struggles with domesticating herself akin to my own story. I can never (well, hardly ever) just accept things and go with it-it's my cross to bear. Boy Scouts was one example as Kyran writes about the experience of creating Pinewood Derby cars and how turning that block of wood into a finished car with an uninterested husband was quite an accomplishment. We let Teenage Boy, a 4th grader at the time, participate for a few months (he begged) before we had to yank him out because my husband and I were so uncomfortable with the zealous flag waving, burning books mentality. I love my country but not in that way and when we sat down and explained the short list of what we didn't appreciate about the scouting experience he completely understood-as a fourth grader! I could easily sit on Kyran's porch and share a story or two with her and her cozy set of friends. If they'd have me. It's never easy to leave our roots behind but we have to realize it is exactly those roots that make us the cool, hip parents we are (or hope we are). This book is fresh and amusing with a perfect amount of reflection to make me look at my role through keener eyes. Be forewarned; A fair amount of cursing comes with several of her rants. Happy New Year's Eve day; welcome to our geekdom.